In our line of business, we are exposed to a wide range of very interesting failures. We also encounter certain types of failures repeatedly, as end users are unaware of the effect of certain load conditions on the performance of their component or equipment. These types of failures are particularly concerning since the fundamental understanding is well known, and is well taught at universities and colleges, but design mistakes and/or misinformed plant selection still occurs. A typical example of this concerns the understanding - or lack of it - of repeated loading and fatigue conditions. It is well known that fatigue failure accounts for between 75 to 80% of all failures, and technically the effect of cyclic stress level, stress concentrations (notches, holes, cracks etc.) is well understood, yet failures still occur surprisingly often. 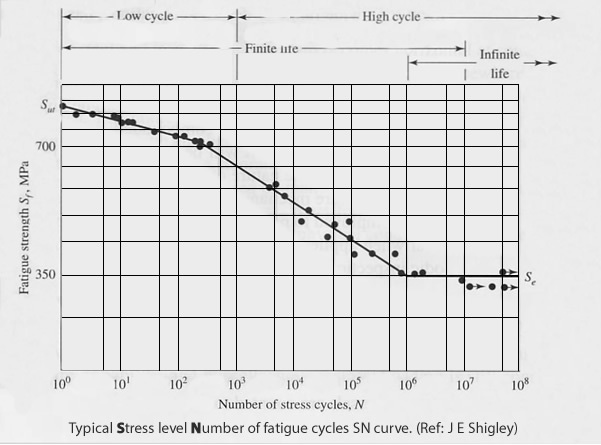 A key concept in this regard is the use of the so called “S-N curve” or Stress level vs Number of fatigue cycles curve, which characterises material behaviour under cyclically applied loading (see SN Figure below). Such SN curve figures are experimentally obtained and comprise a vertical axis of stress level S (on the ordinate) against the number of cycles to failure N, plotted on a log scale. A log - log plot of the experimental data yields an approximate, highly averaged straight line as shown, thus facilitating fatigue analysis and design for particular numbers of repeated loads, and the selection of stress level (and equipment experiencing repetitive loading during normal service) for operational lifetimes. For example and with reference to the SN figure below, a component could readily sustain stress levels of 50MPa for more than a million cycles, yet if the cyclic stress amplitude is increased to 100MPa the fatigue life reduces to only several hundred cycles, before fatigue cracking and final failure occurs. Similar outcomes follow from a more sophisticated fracture mechanics analysis, yet the SN curve is well known and widely applied in design where conservatism is typically required. We come across this lack of understanding of the use of SN and fatigue performance curves frequently. Consider for example a truck mounted crane used to unload cargo weighing 3 tonnes on frequent/repetitive basis. If a crane with maximum lifting capacity of 3 tonnes (at the required working distance) was used it could indeed lift the loads and the job would get done – but depending on the duty cycle specified by the manufacturer it may only last for a limited period. Repetitive use, at full capacity, is likely to lead to a premature fatigue cracking, and ultimately failure. This is well known by the designers (and suppliers) but it is often overlooked by end users even though it is often stipulated on rating plates of the component or written into the operational documentation. In the example above, an awareness of the SN curve concept, such as is shown in the attached figure, clearly shows that if repetitive usage is at, or close to, the maximum capacity is intended then a crane with a higher capacity should be used. Obviously the use of a lower load rated crane would almost certainly lead to premature fatigue cracking and ultimately failure. The message in such cases is clear - make sure that you understand the “log” characteristic of the SN curve, and select accordingly or face the unhappiness of premature failure!